This from Truth Revolt and I love it! Al Gore and his repulsive partner (any partner of Al Bore would have to be repulsive) are suing Al Jazeera on charges of fraud and material breaches in their acquisition of Current Media. They claim that Al Jazeera has unlawfully refused to turn over tens of millions of dollars currently located in an escrow account. That account is held by Current Media shareholders per the terms of the $500-million merger agreement made in January, 2013. And I say the sleeze-bag ExVP deserves it. As I reported here at the time of the sale, Gore only cares about M-O-N-E-Y as evidenced by his silly climate control cash-cow and his willingness to aid, abet and enable civilian jihad in America and anywhere else he can make a buck. At the time of the sale nineteen months ago, Gore was criticized because of Al Jazeera’s perceived anti-American bias and its funding of worldwide terrorism. 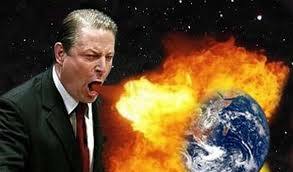 Other criticism came from the belief that as a leading proponent of the climate change hypothesis, Gore was being hypocritical by selling to a network owned by the Qatar royal family, which generated its vast wealth through the mining and sale of fossil fuels. An BTW, if you had Current TV in your cable TV line-up before, you now have Al Jazeera thanks to Al Gore who sold his station for $500 million. A true patriot, huh? It’s called civilization jihad. They clean up their act, put on a suit & tie or a nice dress (the men always have beards as required of Muslims) and infiltrate every aspect of our lives; the media, our military (Major Nadal Hassan), our school systems, every level of government, even our Christian churches. Then they send tentacles out and do their dirty work from within. Some examples are Huma Abedin (former chief of staff for Hillary Clinton), Grover Norquist (head of Americans for Tax Reform), US Representative Keith Elison (who used a Koran when sworn into office) and US Representative Andre Carson of Indiana. The Muslim chaplaincy services for the militar and prisons (a great recruiting gound for radical Islam) were started by Abdurrahman Alamoudi, who was convicted in 2003 on terrorism-related charges. The list goes on and on. And today’s story is of a guy who is a Senior Dept. of Homeland Security advisor, and where else would a good Muslim insert him or herself? Here is the story in part: reblogged from The Clarion Project. 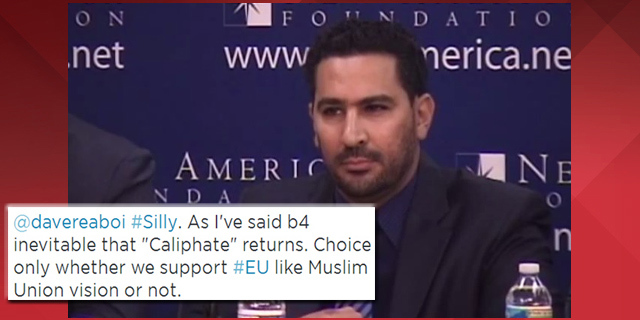 A firestorm has erupted online after senior Department of Homeland Security advisor Mohamed Elibiary tweeted that a “Caliphate” is inevitable and compared it to the European Union. He also recently criticized “drive-by” attacks on Islamism. Elibiary has a history of pro-Muslim Brotherhood advocacy and has close ties to a Hamas financier. Elibiary is on the Department of Homeland Security’s Advisory Council. He is also a long-time official in the Texas Republican Party and was a delegate for Republican presidential nominee John McCain in 2008. As Clarion Project reported in May 2013, Elibiary sat on a committee tasked with reviewing counter-terrorism training guidelines. The result was predictable: An Islamist-friendly product designed to marginalize Muslim reformers and Brotherhood opponents. In a follow-up tweet, he claimed that both political parties are “heading in that direction” of supporting a modern caliphate. As evidence, he pointed to the Bush Administration’s appointment of an envoy to the Organization of the Islamic Conference and the Obama Administration’s engagement of the Muslim Brotherhood. In another tweet on June 21, Elibiary compared “drive by media slander of Islamism” to the segregation-era when African-Americans were treated as second-class citizens. In other words, the critics of the Islamist ideology are bigots. Gee this bigot things if you criticize anyone sounds very familiar doesn’t it?